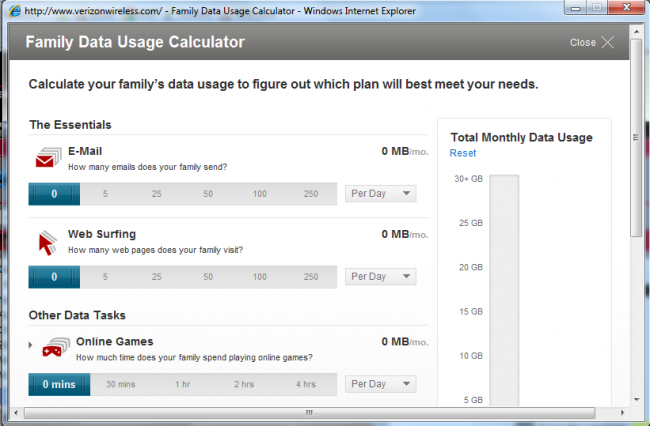 Verizon’s Family Data Usage Calculator Spotted, Plans Almost Upon Us? It’s no secret, Verizon is preparing to introduce Family Data plans at some point in 2012, potentially during Q2 or Q3. Company executives have mentioned it a handful of times and we have seen changes made to billing systems for months now to prepare for it. The move is definitely happening. Not that we were expected to see them, but prices are not included in the calculator. This tool is made for one purpose, to get you to decide during the checkout process how much data you think you need since Verizon has tiered data plans now. Family data plans could be a big deal, especially for those with multiple lines that see varying amounts of data usage. The key here is obviously the pricing – something we have nothing to compare or get a feel for since Verizon will be the first to introduce plans of this kind.